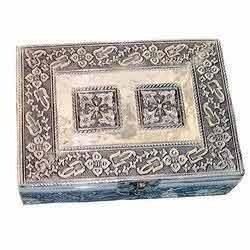 We can provide the variable size and design too of Decorative Boxes according your expectation. Owing to our expertise, we are engaged in manufacturing; exporting and supplying superior quality Decorative Dry Fruit Box. The offered dry fruit box is designed by utilizing best grade unfinished material and latest technology in sync to the market standards. 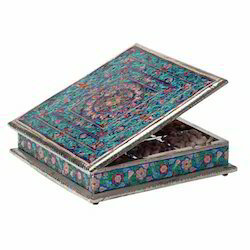 This dry fruit box is used to for gifting purpose. Along with that, we are offering this dry fruit box within the stipulated period of time at reasonable rates. 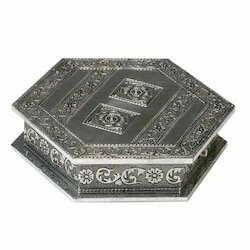 We are among the well-known manufacturer, exporter and supplier of excellent quality range of Aluminium Decorative Boxes. This beautiful Aluminium Decorative Boxes is designed by utilizing top grade material and modern technology by vendor’s talented & creative professionals. 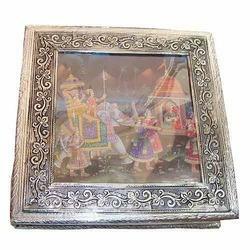 This photo frame is broadly demanded in market. Our quality specialist examined the offered Aluminium Decorative Boxes on numerous parameters to make certain its quality. 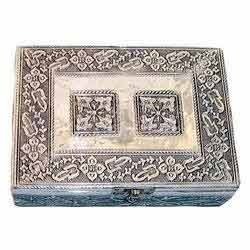 With the support of our adroit professionals, we are engaged in manufacturing, exporting and supplying a wide range of Brass Decorative Boxes. 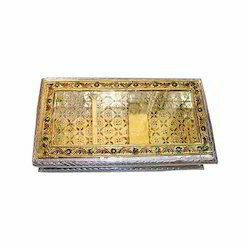 The offered dry fruit box is crafted and designed by utilizing best grade material under the direction of vendor’s proficient designers in accordance with the market norms. 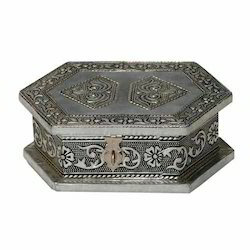 This dry fruit box is praised for its attractive design & durability. In addition, we provide this dry fruit box in various sizes, designs and colors according to the request comes from our customers. Amidst our wide range of products, we are engaged in manufacturing, exporting and supplying a distinguished collection of White Metal Box. The offered metal box is crafted and designed by utilizing best grade material under the direction of vendor’s proficient designers in accordance with the market norms. This metal box is praised for its attractive design and long lasting shine. In addition, we provide this metal box in various sizes, designs and colors according to the request comes from our customers. 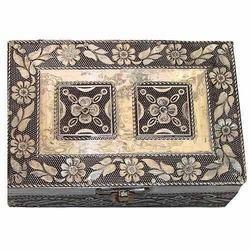 This hand carved Decorative Box comes from India...likely a souvenir box from said country! It is in excellent condition, has been cleaned up and is ready for a new home. The carving pattern is vines of flowers! 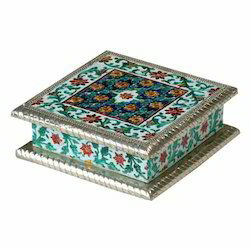 This is a beautiful decorative box for any décor and perfect Measures..
We are also dealer of aluminum candle stands, metallic religious crafts, metal handicraft items, metal lamp bodies, metal flower vases, metal garden planters, aluminum candle holder, brass designer vases, aluminum handicrafts, aluminum vases, aluminum picture frames, aluminum bowls, brass decorative candle holder, brass candle pillar holder, brass wine bucket, aluminum ice bucket. We are also dealer of trumpet vases, designer flower vases, crafted flower vases, handcrafted flower vases, brass stone statues, bronze sculpture, crafted metal wares, sculptures, kitchenware, epns handicrafts, antique candelabra, decorative candle stands. 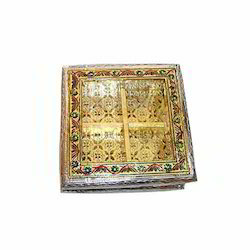 We are also supplier of scented votive candle, designer votive candle, wax pillar candles, perfumed wax candles, brass urns, brass articles, brass art ware, brass candle holder, brass flower vase, brass statues, brass vases, brass wall hanging, brass decorative balls, brass corners, brass mirror frame, brass animals, brass picture frame, brass decorative sphere, brass table lamps. We are also dealer of antique brass planters, brass planter, contemporary wall sconces, decorative wall sconces, antique wall sconces, bathroom wall sconces, brass wall sconce, wall sconce candle holder. 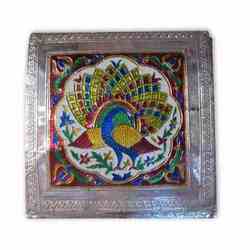 We hold expertise in offering a high quality range of Aluminum Artwares. This beautiful art ware is designed by utilizing top grade material and modern technology by vendor’s talented & creative professionals. This art ware is broadly demanded in market. Our quality specialist examined the offered art ware on numerous parameters to make certain its quality. We are also wholesaler of water glasses, metal glasses, iron candle holders, brass cutlery, antique metal candle holders, antique aluminum candle holders, brass tall candle holders, candle stick holder, flower vase, decorative flower vase. 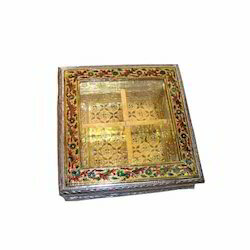 We are also manufacturer of Decorative Metal Box ,collapsible boxes, collapsible storage boxes, collectables - wooden almirah, collectible & antique handicrafts, color changing mugs, color floor carpets, color paper bags, colored soapstone. 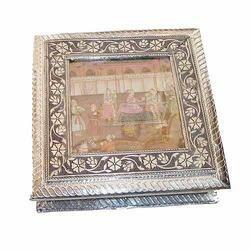 We bring forth an extensive range of Indian Decorative Boxes. Our dry fruit box is well designed by utilizing high quality basic material and latest technology under the visionary observation of our professionals. The offered dry fruit box is broadly praised among our customers for its design, excellent finish and fine quality. 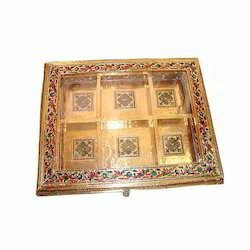 Along with that, we offer this dry fruit box with various specifications at reasonable rates.